Belgian diatonic accordionists Anne Niepold and Aline Pohl have produced a remarkable recording of duets for squeezeboxes, alternately pure and simple or exotic and daring. Here come two talented girls with their diatonic accordions. Anne Niepold and Aline Pohl, Deux Accords Diront, are endowed with some twenty nimble fingers, and about hundred ounces of perfectly working brains, which make it quite easier for them to create, compose, play and record the music they love. The two generous and meticulous "poulettes" - that's how they call themselves - have prepared twelve exciting and innovating titles, neither trad, nor jazz, classic or world, but all of this together. 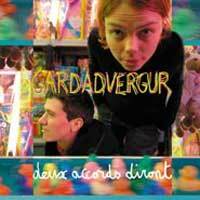 Add some musette, bewildering melodies en adventurous improvisations, sprinkle everything with their own sense of humor, and you'll get Gardadvergur, a CD proving that, in our kingdom, the braces piano is as fit as. a fiddle! A few words from the press: Deux Accords Diront don't want to confine themselves to only one genre. So much the better, because the outcome of that mixture is fascinating: surprising, spontaneous, free. Beside the strictly musical aspect, those two musicians present a true and funny show. With humor and self-mockery, they share their passion with the audience. They like that and they communicate it wonderfully.